Wetlands are defined as areas of land that are saturated or covered by fresh, brackish (slightly salty) or salt water at least part of the year. Wetlands include marshes, swamps, bogs, mudflats and vernal pools. It is the presence of water that is so important to life. Many creatures that spend most of their lives elsewhere, including many fish and insects, were born and raised in wetlands. Because of the abundance of food and shelter provided by the wetland vegetation most wetlands are rich with diverse species. Wetlands also act as natural pollution, flood and erosion protection mechanisms. Coastal salt marsh vegetation has been found to be up to twice as productive as corn, three times as productive as wheat and twenty times as productive as ocean vegetation. Unfortunately most of southern California’s coastal wetlands have been lost to development. This loss has endangered many species of plants, birds, fish and other wetland wildlife. 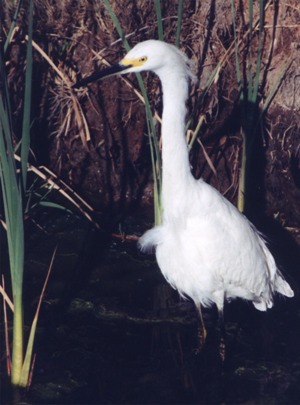 Throughout the USA it is estimated that one third of all threatened and endangered species are found in wetlands. The freshwater sources that feed the estuary bring nutrient-rich sediments that accumulate in the estuary instead of being washed out to sea. The ebb and flow of the tide causes a continual mixing of the water that distributes food and nutrients throughout the Bay and maintains a high level of oxygen in the water to support demands. The duration and intensity of sunlight in areas like southern California coupled with the shallow water in the estuary provide ideal conditions for photosynthesis by the microscopic plankton in the water that form the start a complex and highly-productive food web. As stated above, in an estuary the water level rises and falls with the tide. As the tide falls shorebirds are able to feed on the worms and shellfish living in the mud that is no longer covered by water. The tides are caused mainly by the gravitational pull of the moon as it passes overhead. When the moon is new (on the same side of the earth as the sun) or full (on the opposite side to the sun) the pull of the sun reinforces that of the moon and larger tides called spring tides occur. At Upper Newport Bay there are two high tides and two low tides roughly every day. When there is a spring tide there is about 8 ft. difference between high and low water level.